Jazz up your toast with some fresh fruit and cheese for an epic breakfast of Strawberry, Avocado, and White Cheddar Toast! HAPPY TOAST TUESDAY, my party people. It’s Linley (again) bringing you another TOAST TUESDAY. 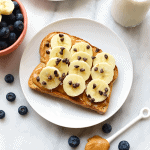 Just a reminder…once a month (on a Tuesday) we are going to chat about toast, life, and everything TEAM FIT FOODIE. I am currently sitting in my apartment that has NO air conditioning (but I still love it) sweating my BUM off. Minnesota summers can be a bit rough if you don’t have air, but hey….it could be worse and I’m surviving. One thing that makes the Minnesota heat bareable is THE RIVER HOUSE. I was so excited to write today’s post because we have yet to update everyone on our latest river trip that hosted the first annual Team Fit Foodie Retreat, Memorial Day celebrations, and my cumpleaños (birthday). It was a dream. If you follow FitFoodieFinds on Snapchat, you got a little taste of the weekend already. After the shoot, Lee’s sister Michelle and my roommate Britta joined us for more birthday celebrations on the patio of Muddy Waters in Prescott, Wisconsin where a good time was had by all after a couple yummy mojitos and DELICOUS pizza. The weekend only got better from there. Since it was a Team Fit Foodie RETREAT, we decided good food, hard workouts, and avocado masks were a MUST. Check, check, and CHECK. Friday night, my lover man (Cole) and my brother (who is also Emily’s boyfriend…SNIZZZZAP) along with some of our other besties met us out at Rush River Brewery for a couple refreshing beers and a good time. YOU GUYS, it was SOOOO FUUUN. Rush River Brewery is in the middle of no where in a warehouse neighborhood outside of River Falls, WI (Google it, people). Everyone’s favorite beer of the evening was definitely the Kirsch (a sour beer). The rest of the weekend consisted of all the BEST people, amazing food, and lots and LOTS of time on the dock. You really can’t go wrong with a weekend like that. Cole was in charge of the largest meal of the weekend (and cocktail mixing) and he sous vide 16 lbs. of pork (THATS A LOT OF PORK), shredded it, and a beautiful meal of pork tacos OR pulled pork sandwiches was made. IT WAS THE BEST BIRTHDAY DINNER OF MY LIFE. 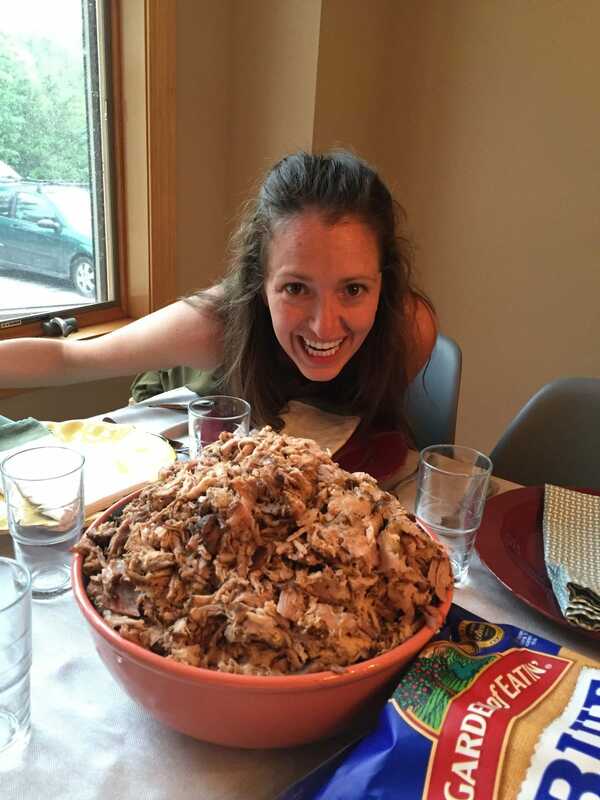 Look, this bowl of pork is like 8 times the size of my HEAD. It’s no secret that Team Fit Foodie has a WEE obsession with AVOCADOS. There is just no getting past its creamy, savory goodness. 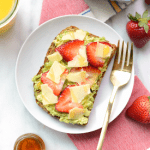 We wanted the best of both worlds for today’s toast and THUS….this Strawberry, Avocado, and White Cheddar Toast was born. 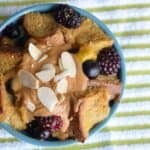 Three ingredients that a lot of you probably have in your fridge right now, but never thought to thrown on toast. It’s DIVINE. 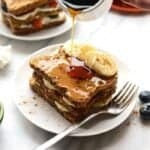 The finishing touch of this scrumptious toast was HONEY. Just before we taste tested, Lee finished the toast off with some honey and BAM…a breakfast that you didn’t think could get any better…got MUCH BETTER. Pour yourself a cup of JOE and enjoy some dang toast! First, pop your bread in the toaster. Next, in a small bowl, mash the avocado. When bread is toasted to perfection, spread mashed avocado, strawberries, and cheddar cheese on top of the toast. Finish by drizzling honey over the toast with a little sprinkle of sea salt.